Wishful Thinking was the pedigree name of our first liver-and-white Springer Spaniel. She was born in 1972, and departed this life in 1986 aged 13: I like to think she lived a long and happy life. She is greatly missed, but after a long period without a resident pet, Miss Poppy has definitely filled the gap. Wishful Thinking Bulletin Board System was named in her memory. Bulletin Boards, or BBS were a precursor to the Internet; most of them have closed now, but in their heyday there were over 32,000 worldwide, with a variety of specialisms. It will come as no surprise to those of you reading this who are aware of my present involvement with Genealogy on the Internet that mine was Genealogy! Indeed, transcriptions from Wishful Thinking's File Area contributed towards the foundation of GENUKI, the UK & Ireland Genealogical Information System which began in 1996. Wishful Thinking BBS closed on June 30th 1999, having been online since mid 1994. 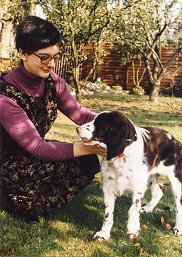 The photograph shows the original Wishful Thinking (or “Mish”, as she was affectionately called) and me, in about 1980 in my parents-in-law's garden in Trowbridge.